Cook County Commissioner Bridget Gainer discusses her annual holiday drive and trying to help people see the government as a positive force in their lives. Adam Jahns of the Sun-Times discusses the meaning of the final month of the season, John Fox’s future, Mitch Trubisky’s development and joins Jeff on a deep dive into Kevin McAllister’s insanity. Bill Murray from Scrooged! and Christmas music from everywhere! You can still donate to Commissioner Gainer’s cause by VISITING THE ORIGINAL POST. DBB Weekend Show – Christmas Episode! 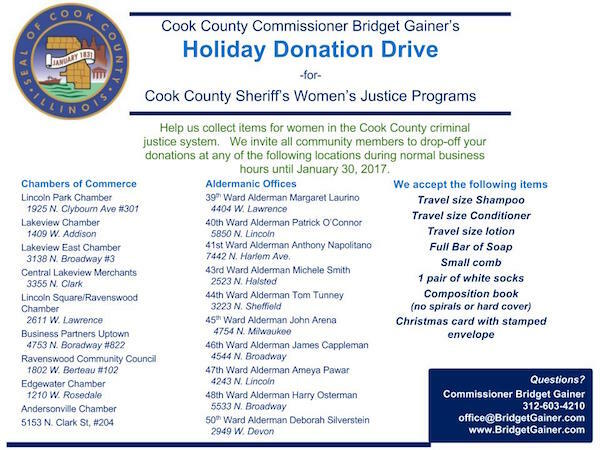 Cook County Commissioner Bridget Gainer talks about devoting special interest to the women and children in the County’s criminal justice system this holiday season and beyond. To help out this worthy, please visit the website (www.bridgetgainer.com/holidaydrive) or see the image below.